Crispy roasted cauliflower sits a atop a creamy tahini and cauliflower puree with just a hint of lemon. Perfect picnic food or as a main course paired with a dark leafy salad. This recipe has been updated from the original February 2015 version in order to provide a better experience for our readers. Every time I make this roasted cauliflower tart I have such lovely flashbacks of the first time I made it. We were living in a little two bedroom townhouse at the time and I had this great island bench in the middle of the kitchen where I would do all my dabbling. My sister would come around bi-weekly for a ‘cooking lesson’ which consisted of wine, eating and gossiping. Such a simple memory really, but with a new baby comes a period of a mediocre social life so this was always a fun time for me and I still get the warm and fuzzies when I think about it. The roasted cauliflower tart turned out to be awesome as well, which helps with building great memories. I’m fairly sure I would not look back on this meal quite as fondly if it had been a flop of a dish and a monumental waste of ingredients. How Do I Serve Up a Roasted Cauliflower Tart? My favorite way is to serve this up with a side of dark, leafy salad and a nice glass of wine (for memories sake ya know). But I still think it was better that night we picked at it over a glass of terrible cheap wine, sitting at the island bench, chatting to the baby. It also works great as an addition to a picnic basket. Just chill well first so that the tart sets properly for easier transportation. The instructions provided are for a store bought pie crust. If you are using a homemade pie crust then follow the instructions required for blind baking that crust. Don't let the long list of ingredients put you off. This tart comes together quite quickly and doesn't require that much in terms of preparation....the result is totally worth it! No unfortunately I love in California now and she is still in Australia so it’s a bit hard 🙂 Thats why I started the blog though – so she could cook along with me, not that she does, but she does read the posts with a glass of wine so there is a hint of tradition in there! It really amazes me, how versatile cauliflower is. I would’ve never thought to use it like this in a tart! I’m all about savory tarts too, so this is right up my alley. Pinning for future! Its is so versatile, we have used it in soooo many ways! What an amazing looking tart. I love spicy and this would certainly be welcomed and enjoyed in our family. It would be such a great healthy alternative to a heavier tart. I’d love this with a side salad and of course a glass of white wine. This is my kind of tart! What a creative and unique way to serve cauliflower. I am something of a roasted cauliflower fiend…it’s one of my top 5 favorite vegetables. I’ll make up a batch and snack on the roasted florets straight from the pan. 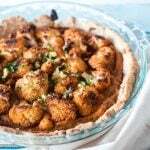 I love how you’ve combined pureed roasted cauliflower and the beautiful florets in this tart. It’s so pretty. I would absolutely make a meal of this! 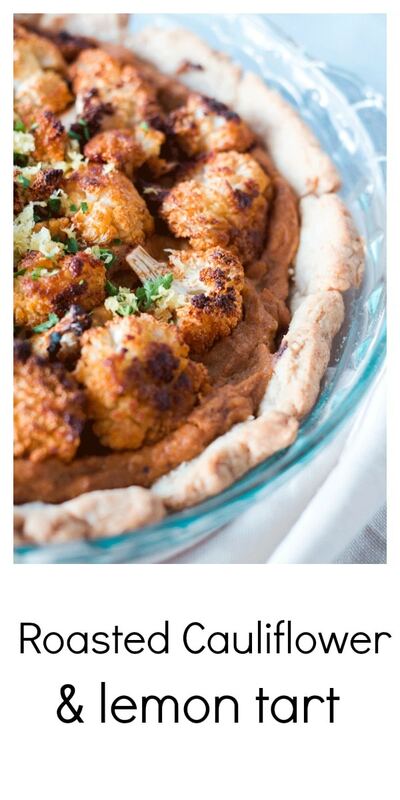 What a great idea to puree part of the roasted cauliflower to make the base of the tart while leaving the rest whole as the topping. That keeps everything streamlined and the ingredients list shorter. All good things! 🙂 And a great story too. I used to talk to my daughter and tell her what I was cooking when she was a baby (now she cooks with me). I love how you use the same ingredients in two ways – as the filling and the topping. It’s a really great idea. The tart looks absolutely scrumptious and satisfying, yet healthy. Oh, and the memories! I love food and memories. Food is such a time machine. I am sure your baby enjoyed those lessons and they will one day be a nice story for you to tell her. That is such a funny story, I can picture it right now. Good memories. I love roasted cauliflower, there isn’t anything quite like it. Putting it in a tart sounds genius, definitely saving this for later, with a glass of wine, of course! I’ve never heard of a cauliflower tart before, it sounds and looks so good! I love the flavor profile used here and can’t wait to give this a try. I love the sound of this tasty tart. It would be a great side, and I would even eat this for lunch or brunch. I would have never thought to use cauliflower this way…..but we roast it all the time. Awesome. Haha cauliflower tends to end up in so many random dishes in our house because we love it so much! Pour a glass for me and hand me a plate. I just love this kind of inventive, healthy fare! I love this approach to cauliflower, which is getting a lot of attention right now!